Right roof gutter sizing is essential for efficient rain collection. This is very important for the wetter months of the year and during periods of heavy thunderstorms. Proper roof gutter sizing for your home also requires doing a lot of calculations and adjustments. Fortunately for our readers, we have done all the maths for you guys! You can thank us later. 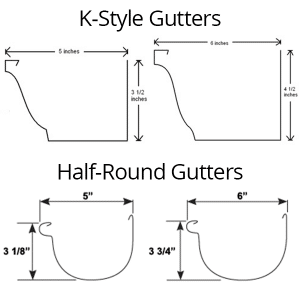 Below is a brief explanation of how to go about properly doing roof gutter sizing. These two types are able to handle the rainfall on majority of homes statewide. 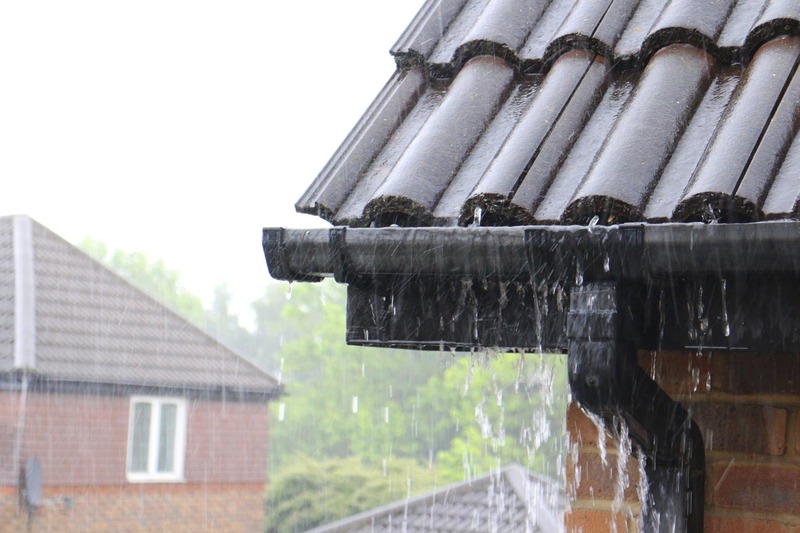 Houses with big, steep roofs however may need wider gutters and extra downspouts to keep rainwater from overflowing. Same for houses located in areas that receive heavy rainfalls. If you feel your house requires a roof gutter sizing other than these two, please feel free to give us a call. We will gladly guide you in the right direction. To figure out the right roof gutter sizing, our experts have come up with some math done easy for you. First you’ll need to calculate the square footage of the gutter’s drainage area. For a simple gable-end roof, you would only need to make two calculations, one for each slope. Hip roofs and intersecting roofs have multiple facets. For those you will need to add up the area of each surface within a drainage area to get the total square footage. Area can be calculated by simple calculation of length multiplied by width. Next, once you know the total square footage of drainage for each gutter, you’ll need to adjust for the following two factors: roof pitch and maximum rainfall intensity. This is essential for proper roof gutter sizing. Roof pitch is very important for right roof gutter sizing. The steeper a roof’s pitch, the more windblown rain it can collect. You can measure pitch with a 2-foot level and a tape measure: Hold one end of the level against the roof, level it, and then measure the distance between the roof and the underside of the level at its midpoint, which gives you a 12-inch run. A 5-inch gap, for instance, is a 5-in-12 pitch. Once you know pitch, you can find your roof-pitch factor in the table below. Maximum rainfall intensity is also an important factor in determining the right roof gutter sizing. The U.S. Weather Bureau maintains records for rainfall in inches (per hour) for different areas. This is basically the maximum amount of rain that can fall in 5 minutes. From an installer’s perspective, the gutter size will be big or small depending on the rainfall. This will help prevent the gutter from overflowing and taking more load than it should.The higher the amount of rain, the bigger a gutter has to be. Finally, comes the step for sizing the gutters. To do that simply multiply drainage area calculated earlier by roof-pitch factor and rainfall intensity. 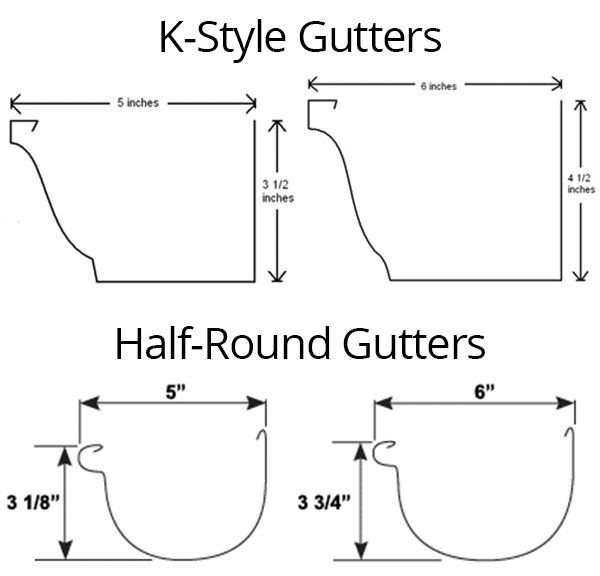 After you have calculated the square footage, use following calculations: for a 5-inch K-Style gutter, the square footage should be up to 5,500 sq.ft and for a 6-inch K-Style gutter the square footage should be upto 7,900 sq ft. For Half Rounds, 5-inch should be used for up to 2500 sq feet and 6-inch for up to 3,840 sq ft. If these calculations seem a little complex, consider this: if roof’s drainage areas call for different size gutters, go for the biggest one. For effortless roof gutter sizing our experts also recommend using 7 or 8 inch gutters if you live in an area with heavy downpour. They will probably require professional installation. That said, they will be noticeably better in handling the excessive water. Remember to give us a call for your roof gutter sizing needs. We have been in the business for over 36 years and we stand behind our work. Our professionals take pleasure in providing quality service and products. We meet or beat any quotes from our competition.